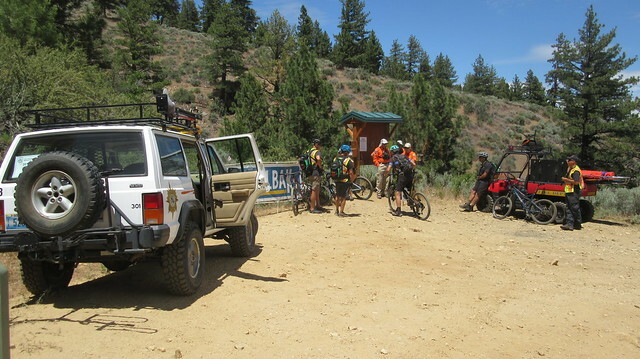 The inaugural Epic Rides Carson City Off-Road event was a huge success! People came from all over the country to participate in this weekend long event that included live music, parties, and other fun activities in addition to the actual racing. It was such a big event, that it was hard to see it all. The festivities were downtown, so if you you weren’t racing, you probably didn’t get to see all the action on the mountain. 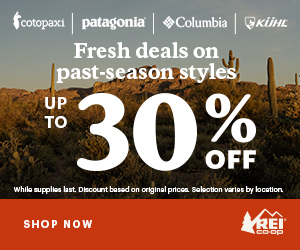 Unless, of course, you were one of the backcountry volunteers! 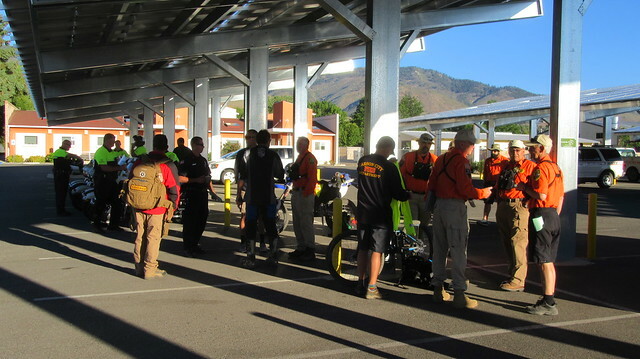 As a member of Carson City Sheriff’s Search and Rescue, I volunteered to help cover the racecourse. We partnered with the Fire Department to provide emergency services and make sure everyone got back to Carson City. Since the courses split for some time, there were well over 50 miles of trail to cover. 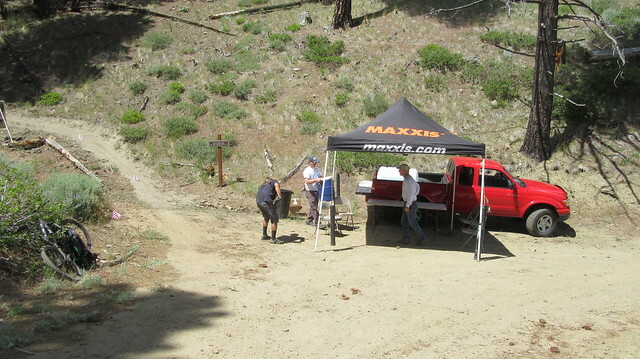 To accomplish this, there were teams of 4x4s, OHVs, motorcycles, and mountain bikes. Extensive multi-day Incident Action Plans were used that covered such things as personnel and other assets, safety, emergencies, and radio communications. Friday was the 15 mile “fun ride”. 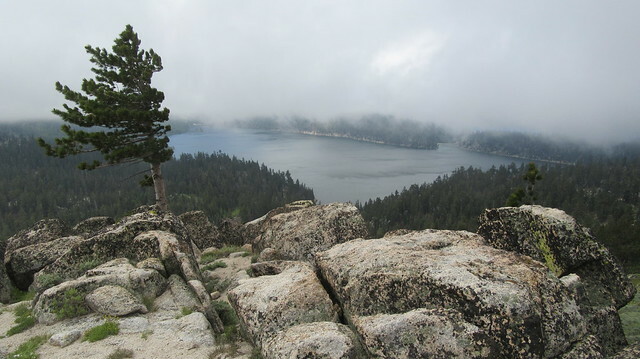 In spite of the name, The Ash to Kings trail is still challenging with all its climbing and narrow mountainside trails. 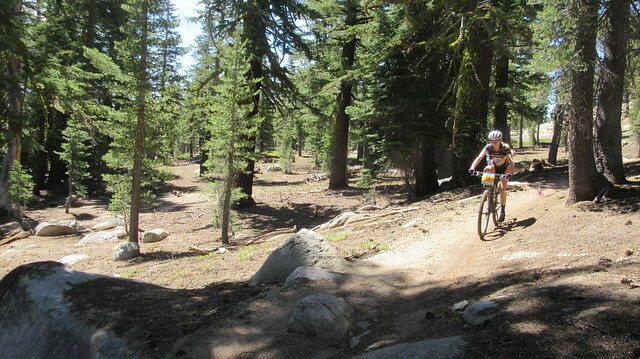 We watched the riders from high above make their way up Kings Canyon, and then eventually go by us on the trail. Even though this was a fun ride, you could tell the people up front were treating it as a race. I was also surprised at how many kids were up front. 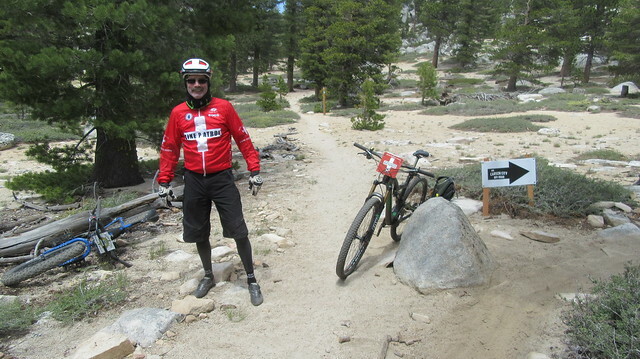 On Saturday and Sunday, I was assigned to the Marlette Lake mountain bike team, quite possibly the best volunteer position on the mountain. 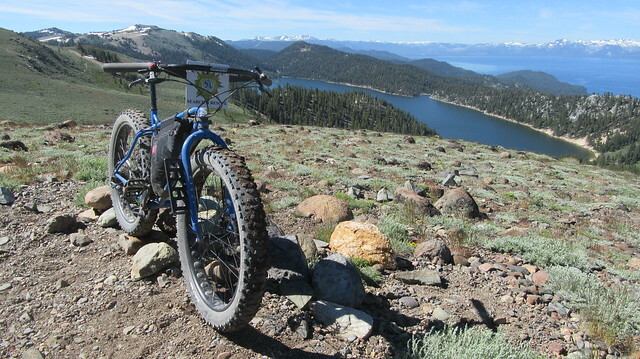 We shuttled the mountain bikes on the back of a Jeep up to 8,200 feet where the Tahoe Rim Trail Crosses above Marlette Lake. From there, it wasn’t much climbing to get to the highest point on the course and the best views. The weather up on top was much colder than anticipated on Saturday morning. 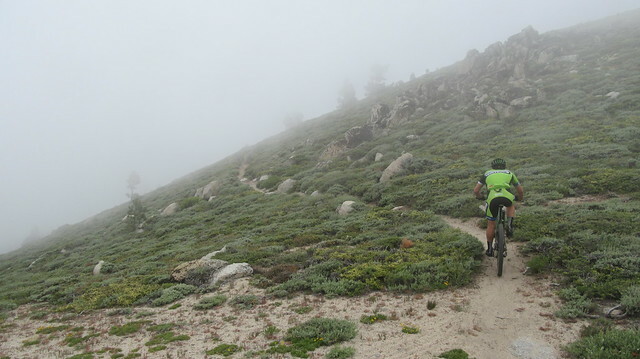 Visibility was limited with the low cloud cover, and the wind was blowing hard across the ridge tops. I had on a warm hat, gloves, fleece, and a windbreaker to stay warm. The only thing keeping the racers warm was the fact that they’d been climbing for about 20 miles. A lucky few had windbreakers with them. I imagine they were eager to get off the top and back into the woods. 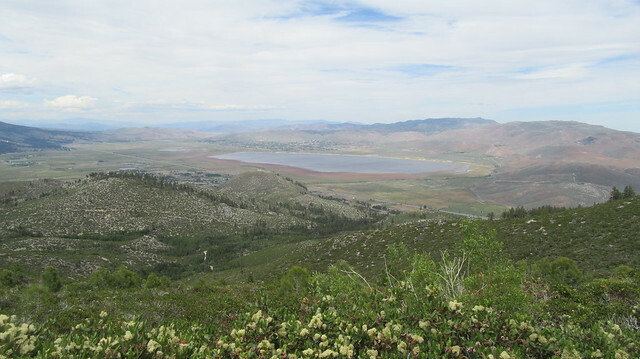 Past Marlette Peak was the big snow bank. It was soft, slippery, and bumpy, and had to be walked across. From the expressions and comments, many riders were not expecting this! 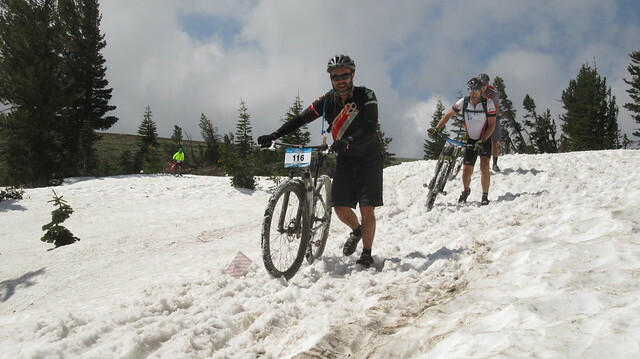 The hike-a-bike across the snow bank. 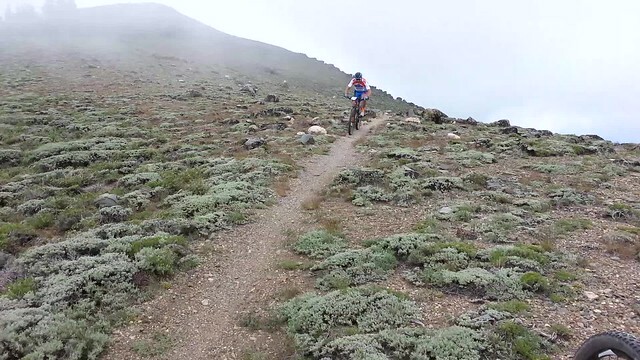 Possibly the most challenging section of downhill was the “Secret Trail”. This old trail is on private property and was opened just for the race. 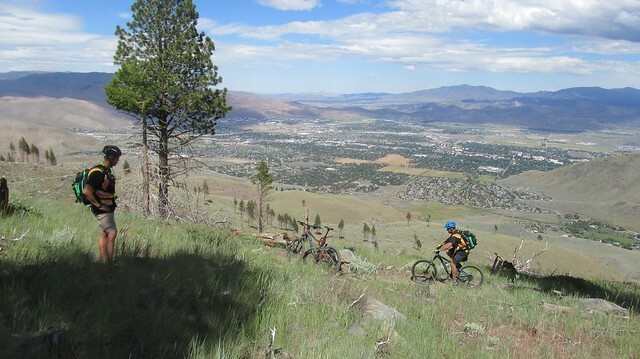 It’s actually less of a trail, and more of a steep short cut to get riders over to Ash Canyon and avoid the pavement. 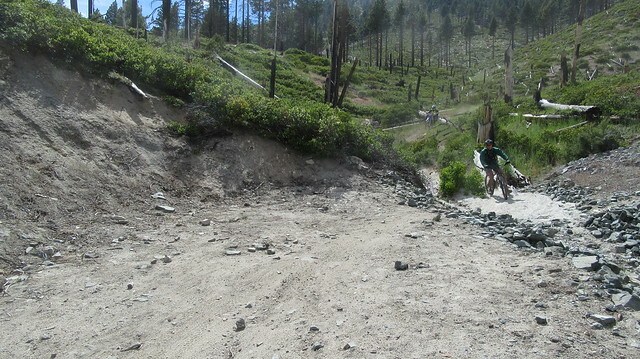 Loose, steep, and rutted, it caused a few crashes. Some riders commented that it was best kept a secret. With several hundred riders competing on Saturday, it was a long day. Many hours separated the first rider and the last, and we didn’t finish up until 7:00 PM, a 12 hour day. I went straight home to get to bed early for Sunday. We had an early Sunday morning muster at Carson Middle School at 06:30. Having worked out many of the logistics on Saturday, we were more prepared to get up to the top earlier. There were less than 90 pros racing this morning, and they’d be at the top quick. 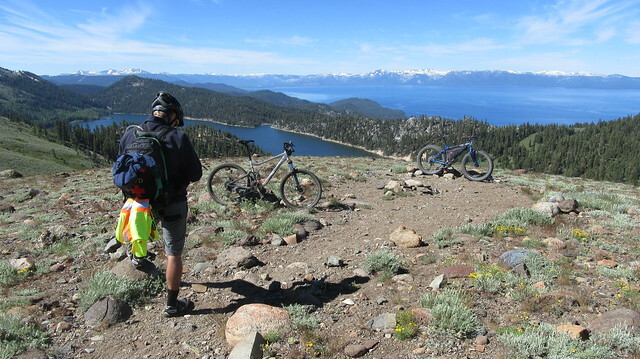 Arriving up top that morning, the weather was MUCH nicer with unobstructed views of Lake Tahoe. We picked a nice viewpoint and waited for the riders. The wait was not long. 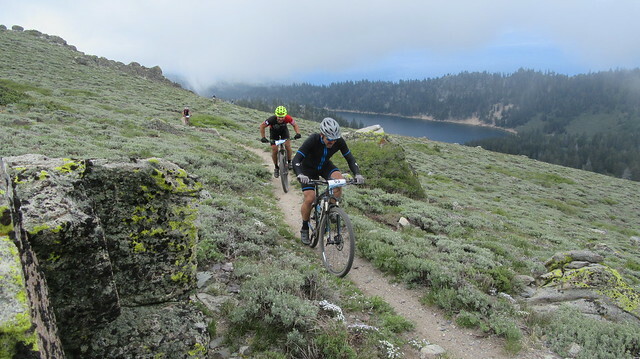 As the riders got closer, we moved down the course to the high point above Twin Lakes. There would be very little climbing after this, and made a great place to start the sweep. That’s when I discovered I had lost my handheld GPS. The last place I saw it was a mile back. 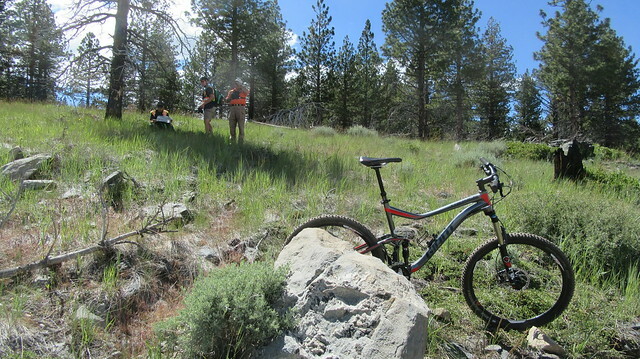 Just as I started to go back up the trail to search for it, the first pro riders started coming through. 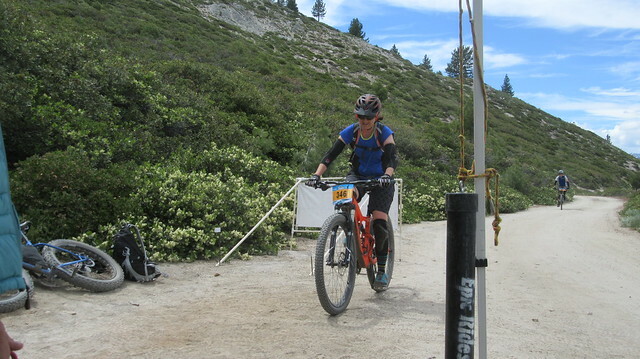 It was a challenge to ride, look for a GPS, and stay the heck out of the way of the race. The men and women were flying through this section, and the last thing I wanted was for someone to hit the brakes because of me. 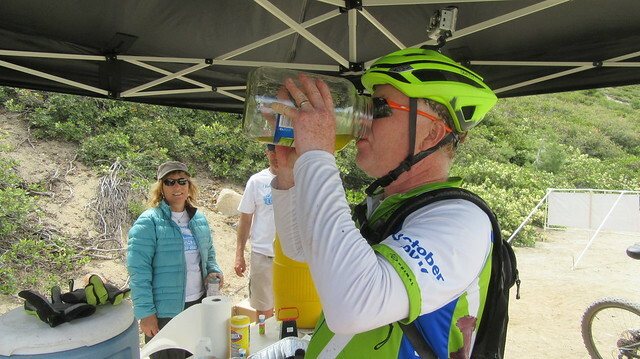 I did not hinder progress, and was amazed at how fast the riders passed me through the woods. I ended up finding my GPS, but missed most of the photo opportunities in the process. In a short amount of time, all riders had passed and it was time to sweep the course. 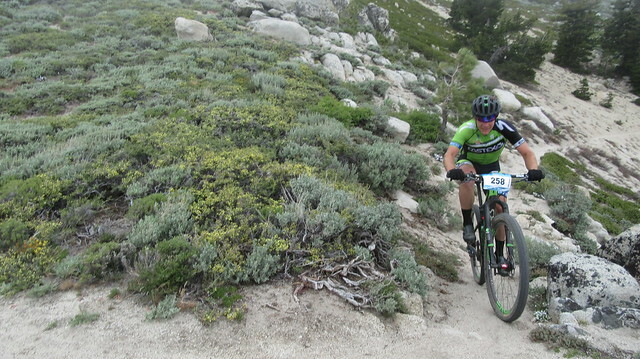 We watched the last female pro rider pass, but that’s the last time we saw her. We followed her progress over the radio traffic as she passed all the checkpoints. 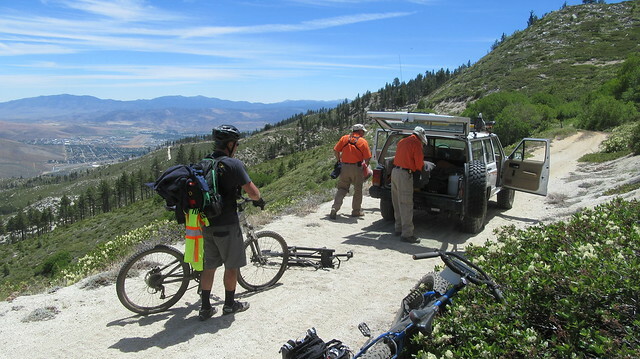 Much earlier this time, we started pulling resources from the mountain as the riders finished the Ash to Kings Trail. There were only minor injuries reported and one person was treated for heat exhaustion over the entire weekend. That’s not bad for 600 riders on a difficult course! 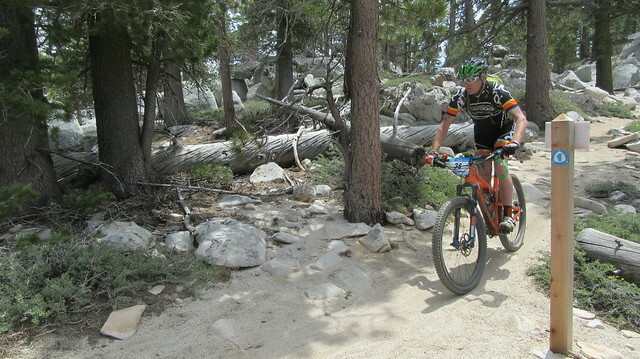 Even though I missed all the downtown festivities (I think I’m the only one in town who didn’t get their picture with mountain bike legend Gary Fisher), it was fun to get to see so much of the racing action up top and ride the trails. I got over 50 miles of riding in over the weekend, mostly downhill at a leisurely pace, and I was still worn out. I can only imagine how tired the racers were at the end! I think most of us felt the weekend was going to be a big event, but I was still waiting to see if it lived up to the hype. I was really surprised at how well it did go. 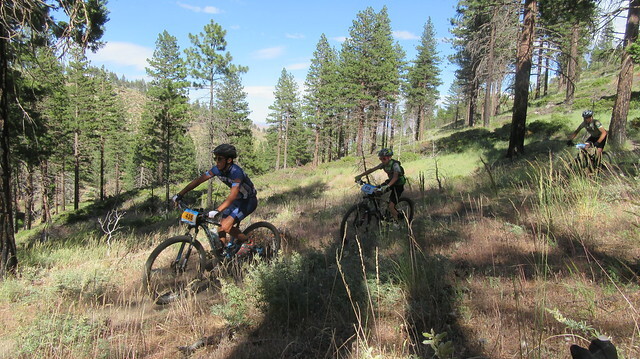 I talked to people from all over the country that had made the trip out here to ride and race, and they all had big smiles and loved the trails. There was very little complaining about the huge climb. They’ll be back, and they’ll bring their friends. Next year they plan to increase the race entrance cap from 600 to 1,200! The thing that really stands out, though, is the hundreds of volunteers, both paid and professional, that stepped up to ensure this event was successful. Public Works, Sheriff’s Office, Search and Rescue, Fire Department, Muscle Powered, the City, Epic Rides, and many others…it took hundreds of man and woman hours to pull this off. This really shows the pride people have in our community and what makes Carson City such a great place to live! More photos from the ride HERE. I am so proud of our community for putting on this event! My husband and I volunteered at Marlette Lake Comfort station and it was impressive to realize all the work done by Carson City staff, volunteer organizations like Muscle Powered and the myriad of community volunteers. I am so excited to do it again next year!!! Thanks for volunteering, Debbie! I may have seen you up there on Saturday.